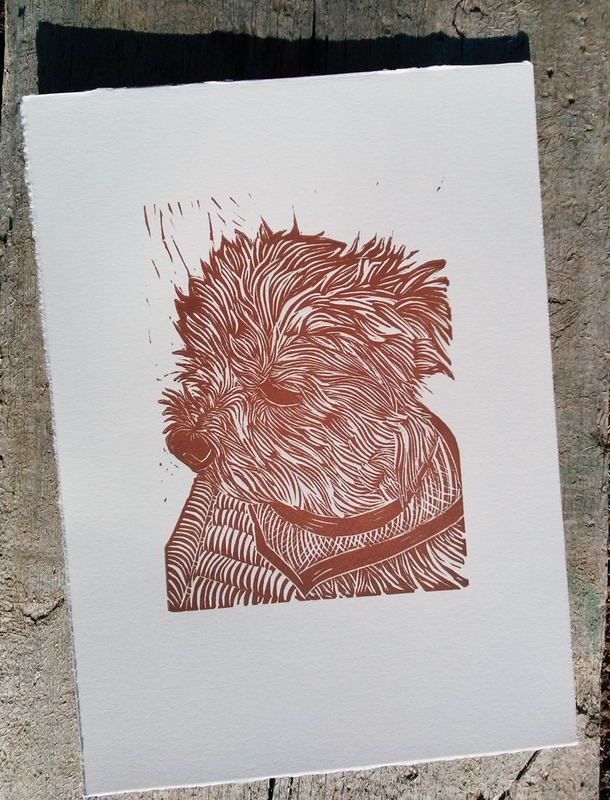 A custom carved linocut portrait of Sam. Lisa Studier left this morning and I got into the studio to catch on a portrait that my dear friend Peggy requested. Honestly, at first I was not so sure I could do a pet portrait. But have already done one for her I welcomed the second opportunity and it was a blast. 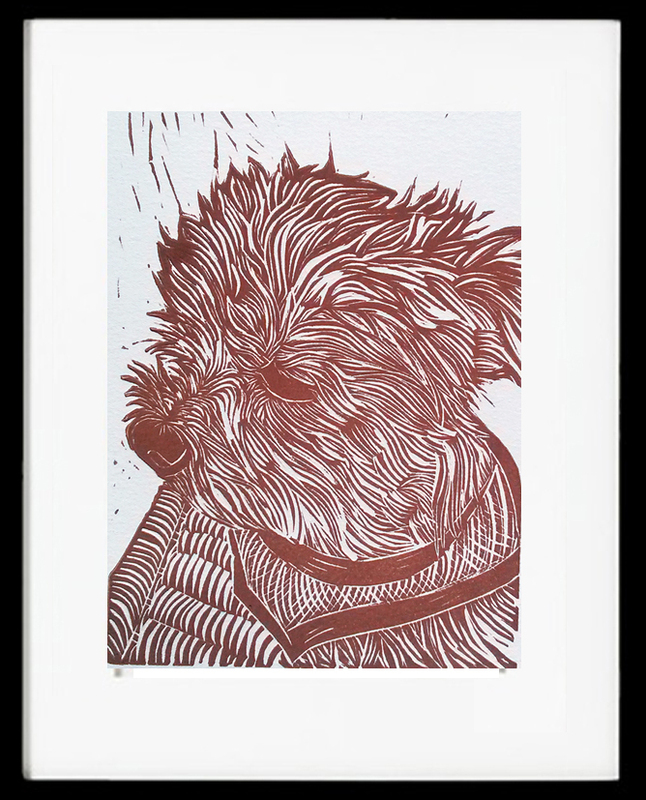 The custom linocut dog portrait is a gift for her daughter, who also supplied the photos for me to work from. 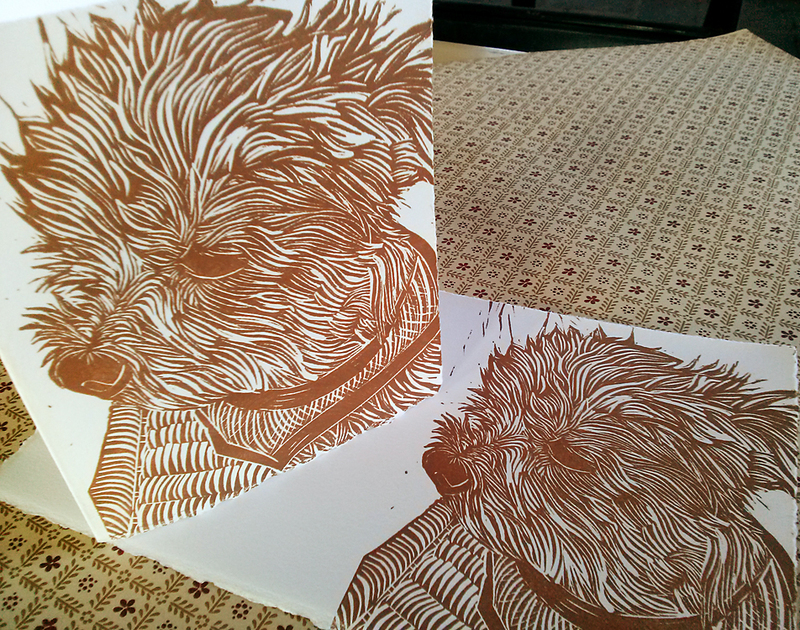 I drew “Sam” onto a 5″ x 7″ linoleum block, carved him out, and set out to print. It was a rough day in the studio. It was very cold, colder inside than outside, some ink colors appeared almost frozen where others were way too runny. I printed and printed and got nothing. I cleaned up, came in the house, and tried again today. And it was perfect. I got a great print of Sam. In addition I made 5 folded gift/greeting cards. These cards are pretty sweet and since it is a gift Peggy can write a message to her daughter in it, plus her daughter will get 4 others she can send out. She can always get more later if she likes. I am going to offer to make up to 3 dog portraits a month. They can take 10 to 15 hours to make, so doing three a month would be super fun. 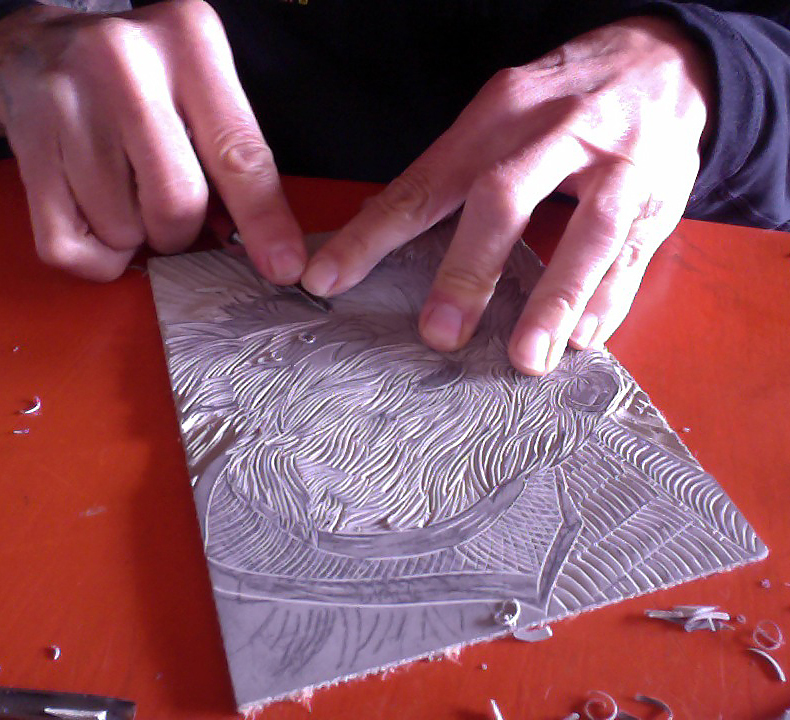 I am beginning some big 24″ x 36″ linocuts all based on mountains, hiking, wilderness adventure in for my fall exhibition and I need to make sure I leave time for those. They take about 60 + hours to carve, but they will be amazing, just as amazing as little Sam here. You can order a custom dog portrait at my Etsy Store. P.S. The color is the same on all of them, despite looking different here. The photos are a bit crappy because they are from my cell phone. I still need to get a new camera.